Recently I posted an offer for Mamasjewelry.com and received the reward of ordering my own special Mother's ring. My ring recently arrived and I must say that it is beautiful. The quality of the ring is very professional and I am so pleased with the outcome. I decided to do something a little different with the ring I ordered. I wanted a ring that kept not only my son and husband close to my heart, but my siblings as well. 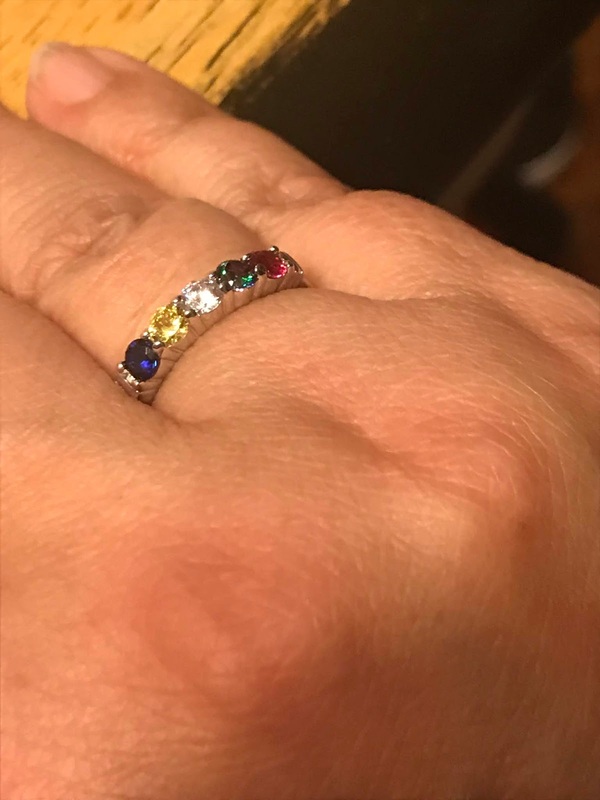 So, I decided to order a ring with all of their birth stones in it. I think of them often and this is a nice way to always keep my family and my siblings and their families close to me at all times. The ring I chose, is done in sterling silver with faux stones. The stones are beautiful. 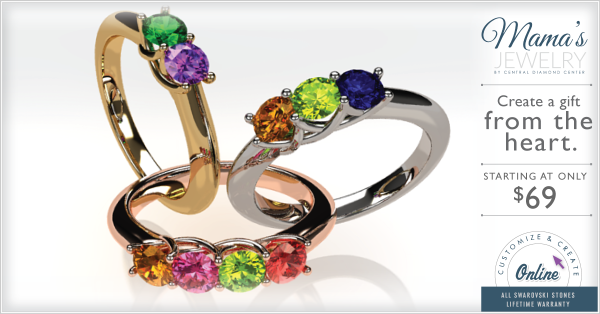 You can have your rings done in sterling silver, white gold or yellow gold. You can also have them done in genuine stones. The choice is up to you. 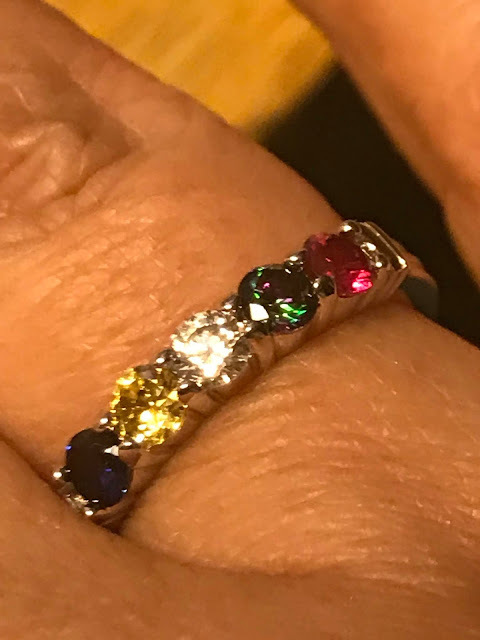 The beautiful ring I have chosen is called the NANA Share Prong Mother's ring and costs only $69 plus tax, in Sterling Silver, with faux stones. It can be made with 1 to 6 stones. Moms, sisters and mom figures work hard 365 days out of the year, so why not give them a beautiful gift they can always enjoy? With the exquisite collection of mothers rings from Mama's Jewelry, you're bound to make this the most unforgettable gift yet! Each time she looks down at her ring, puts on her earrings or is asked about her necklace, she'll remember just how much she's loved. Mama's Jewelry also makes bracelets, necklaces, earrings and religious jewelry pieces that can be personalized. All rings have a 30 day money back guarantee and offer FREE Shipping. A great deal of thought goes into the process of designing these rings, pendants and bracelets. When the customer receives their jewelry there is "wow" factor. We hear it time and time again. We always deliver 110%. Thickness of the shank, the prongs, the quality of the stones, the way they are set; no one gives the customer so much attention to detail like we do. We have over 2100 positive reviews on eBay and thousands of reviews on Amazon and have sold tens of thousands pieces without any complaint. We love jewelry and we want our passion for it to be evident in any piece we offer. What is the Mama's Jewelry Advantage? Simple. We care. Disclosure: This is a sponsored post powered by US Family Guide.